Join us when our Sankofa Red payphone travels to Skin, courtesy of co-founder Ben Caldwell. 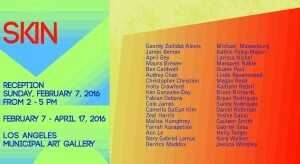 Reception Sunday February 7th from 2-5pm; subsequently open Feb 7-April 17, 2016. For details, see the event page on Facebook. This exhibition, SKIN, addresses issues that have been increasingly prominent since the 2008 presidential election of Barack Obama. It was the first time that an African American had run for President and won. The election symbolized strides thought to have been made in race relations, yet it also revealed ruptures in the “skin” that binds us as Americans, and ultimately, as people. During the last year, events in Ferguson, Baltimore, Cleveland, Chicago, New York City, Prairie View, Charleston, Oakland, and Southern California have revealed chasms in the issues of race and identity. Conversations about race have always taken place within diasporic communities, but in the wake of racially charged events over the last year, it has become a growing part of the national dialogue. Artists in Los Angeles and throughout the country have been galvanized by these events. The objective of SKIN is to bring the conversation into a centralized discursive space, and we are seeking work that is both thoughtful and thought provoking.